Bloc Party were wicked last night. The lively crowd at Chicago's Congress Theatre were warmed up nicely by The Strokes' Albert Hammond Jr, who was promoting his new album. Then the Londoners were warmly welcomed onto stage by a surprisingly passionate crowd. Bloc Party have found it hard to break through in the States, although I believe are more widely known in Canada. Their new album did enter the Billboard chart at number 12 on release though and the hauntingly wonderful So Here We Are is sampled a lot on television here. 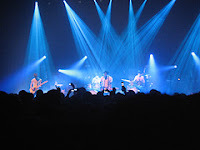 Bloc Party with lead singer Kele Okereke exceptional played the majority of the songs from their first album Silent Alarm and the recently released A Weekend in the City including the new single I Still Remember. It was a great performance and has endeared me to them, as it appeared everyone else there last night, for a long time to come, particularly after coming back on stage for a third time to sing Banquet, a good 5 minutes after seemingly finishing their set.